This product was added to our database on Wednesday 7 March 2007. The German Wermacht on the Eastern Front suffered from night attacks by slow flying small Soviet bombers. Conventional night fighters were too fast for this kind of interception. Therefore, reconnaissance Fw 189s were modified for the night fighter role with the addition of a FuG-212 Lichtenstein C-1 radar and "Schräge Musik" MG 151/20 cannon. The kit contains three sprues with plastic parts, injected canopies, resin cast night exhaust stacks and MG 151 cannon. 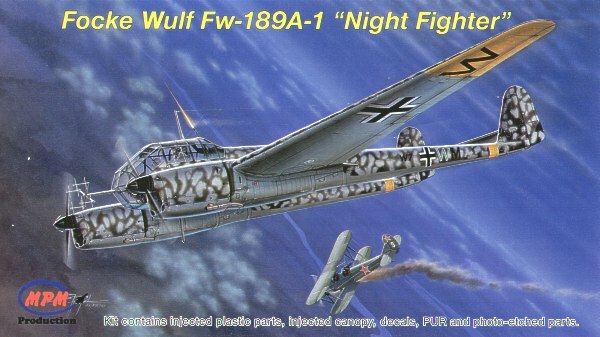 Additionally, it contains photo-etched parts and decals for two night fighters from 1/NJG 100 based in Romania in 1944.